I am not even going to try to explain how amazing and fresh this salad was. I will just say that I felt like I was sitting in the finest parisian restaurant listening to Vivaldi. Hope you get the visual. For everyone who found this blog through my new Instagram account, @mindfoodist, welcome! Every single reader is truly a gift to me, and I hope that when you try out these recipes I do you guys justice. It's the most beautiful spring day in New York and this is my first salad after my water fast. I love Wasabi, every time I go out to eat sushi I take all my friends' wasabi from their plate and whip it over my rice. I always regret it when my entire body feels like it's burning, but somehow that is an addictive feeling. The wasabi in this salad is not over powering, but really subtle. I used it like horseradish, just to make it a little more interesting and urban. 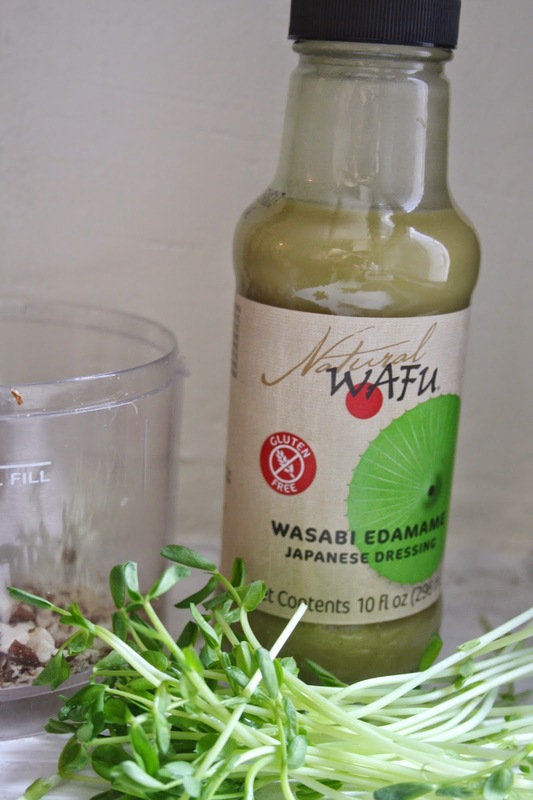 I got the wasabi edamame dressing at whole- foods, and it's vegan, GF and doesn't have too many ingredients. I also just got a food processor and it's TINY. I feel like all I can do with it is make nut butter and pesto, but well I am not complaining. handful of raw or roasted (preference)almonds. 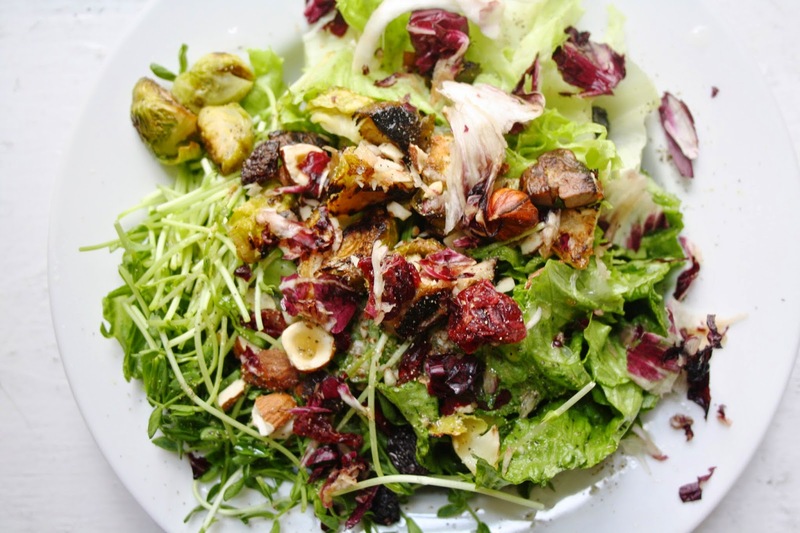 Wash, dry and cut lettuce leaves and adjust on plates alongside the sweet pea shots, scatter the brussels sprouts and the cut portabella mushroom over it. Place the almonds in your ,hopefully not as tiny, food processor, until they are splinters. Add the cranberries and nuts to your salad and grind pepper and salt over it. Take the head of raddichio and shred it over the salad like parmesan, just for a subtle edge. Top with the dressing, et voila! This looks so good! I can't wait to make my own! Thanks!